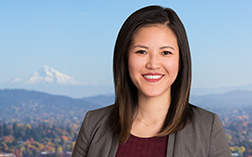 Sharlei Hsu is an attorney in Betts, Patterson & Mines’ Portland office. Her practice focuses on litigation and insurance matters, particularly in complex litigation, products liability and construction related matters. During law school, Sharlei clerked at the Oregon Health and Sciences University in their Office of General Counsel and also Risk Management Department and volunteered representing victims of domestic violence in obtaining legal protection. Prior to joining Betts Patterson & Mines, Sharlei worked at other reputable litigation firms in the Pacific Northwest, litigating high-value products liability, construction and directors and officers matters. She has trial experience in both federal and state courts, having first-chaired and second-chaired trials.